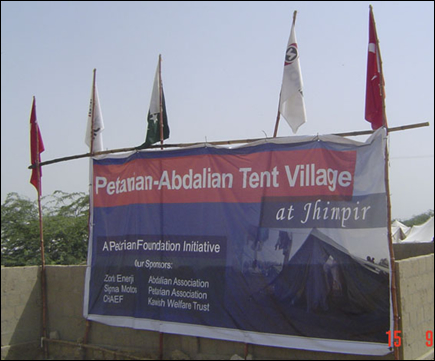 Main signboard at entrance of the Petarian-Abdalian Tent Village showing names of sponsors as well. The camp area was first cleaned out for all bushes and shrubs and levelled before laying out all the tents in proper rows in a neat and clean manner. The camp managers have tried level best to ensure that the camp is clean with no garbage lying around that can cause hygiene problems. 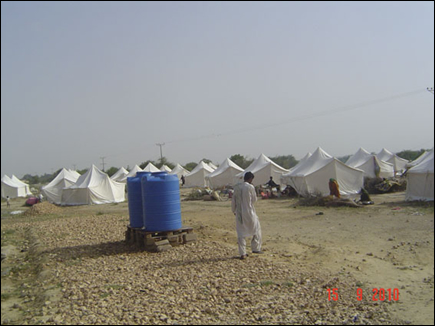 Water tanks are located in different parts of the camp. These are filled up with water from the lake using pump and pipes regularly. 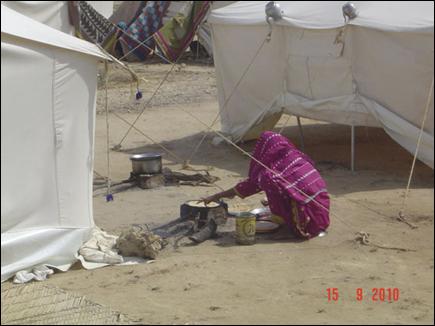 It was late morning, and the women were busy preparing meals using coal and dry wood from nearby areas. 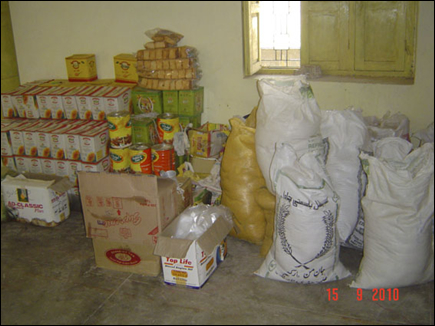 We have provided them the dry rations which they use to cook chapatti, rice, daal and other food items which are part of their staple diet. Picture above shows stores of tents. 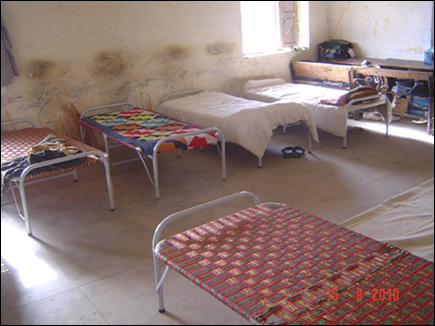 The camp residents are provided with proper toilet facilities along with septic tanks to drain out the sewage. Water is also piped in and stored in tanks nearby. These toilets were built specially by us for this camp. 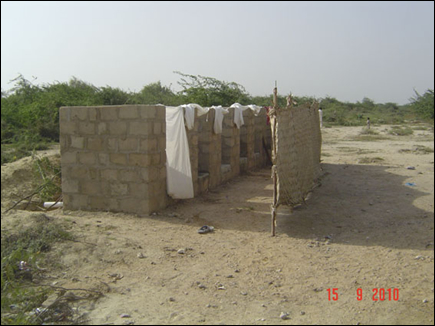 Separate toilets are provided for men and women in different corners of the camp. 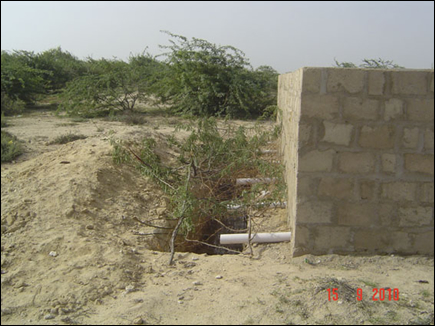 Picture on right shows septic tank to drain out the sewage. Privacy is maintained with walls and curtains at entrance of each toilet. A special water filter plant has been set up for the camp to provide potable water for drinking that is free from bacteria and viruses. 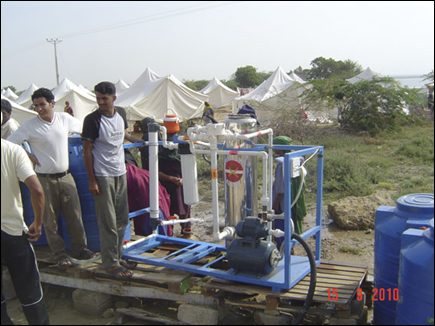 This has reduced water borne diseases at the camp. 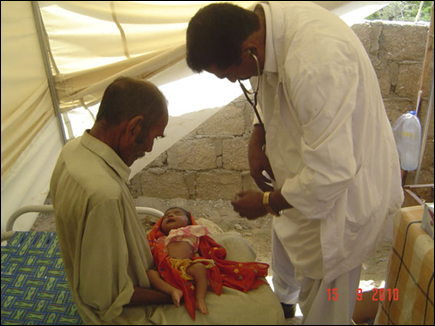 A mini medical center has been set up with one doctor available full time 24 hours a day. 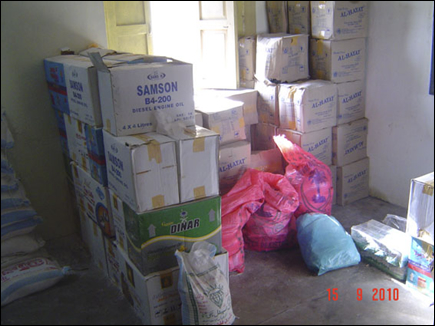 A full supply of medicines is provided. 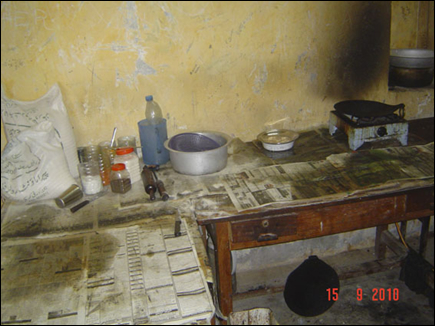 Most of the medical problems are related to diarrhoea, skin diseases, malaria, fever, etc. There are also 4 babies born at our camp so far. One of these was through a caesarian section, and the pregnant lady had to be taken to the nearby hospital for this purpose. Organization provides transport to any patient that needs to be referred to a nearby hospital. 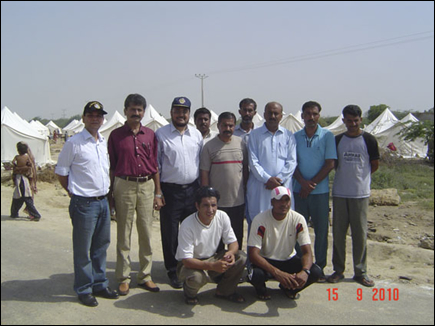 The staff comprises of 22 volunteers and workers who are providing round the clock services to the camp for all the needs including pitching tents, distributing food rations, medical services, school services, security of the area, water filtration, maintaining hygienic conditions, transport and logistics, stores, etc. 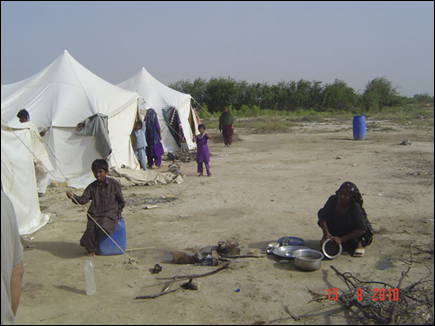 On a daily basis, some families are returning to their villages while new ones come and join the camp. 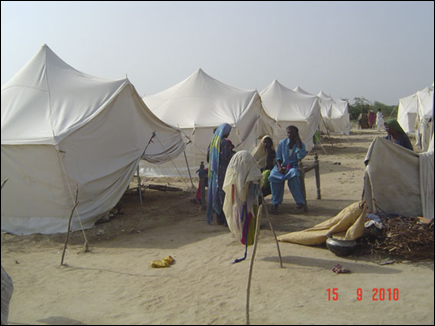 We expect that we would need to operate this camp for the next 4-6 weeks before all the residents would have returned to their own homes. 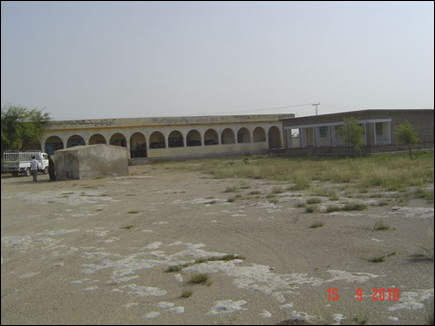 This will be followed up by our program for rehabilitiation / reconstruction. I shall write about this in more detail on our plans shortly, as these are being evaluated and put into place. We have had meetings of our management and committees in this regard to finalize details of the plans. 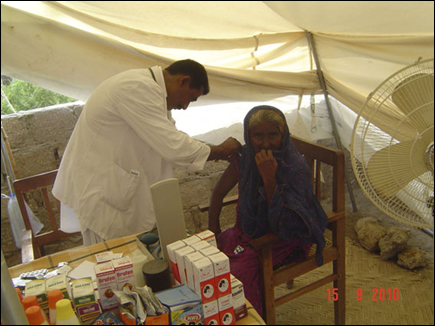 Dr. Agha Taj and his team of doctors and paramedical staff have been continuing to provide medical camps at different locations in Hyderabad / Jamshoro districts, Dadu district and Moro-Nausheroferoz. I shall post details of these medical camps in a separate email insha Allah. 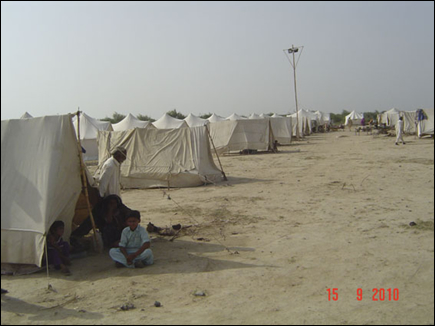 Naeemul Hassan, N-51 has been posting the reports on the camps, food distribution, medical camps, etc organized by our partner organization CHAEF. 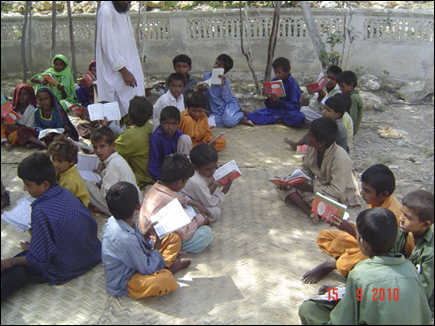 They have been doing work in Sindh, Punjab and KP. Mashallah they have been able to provide relief to thousands of affected people. Please read the reports of Naeem that have been circulated by him. 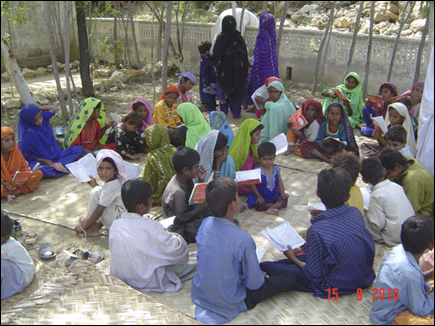 KWT has been doing wonderful work in Kot Addu and Charsadda areas. 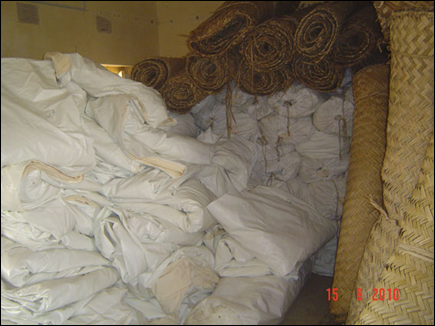 In cooperation with us, we sent 200 tents to DI Khan and also sent 48 cartons of food items to Charsadda. KWT has been providing relief work at their camps at both of these cities.They are also gearing up to do construction of homes as a part of the rehabilitation program. More on this later. 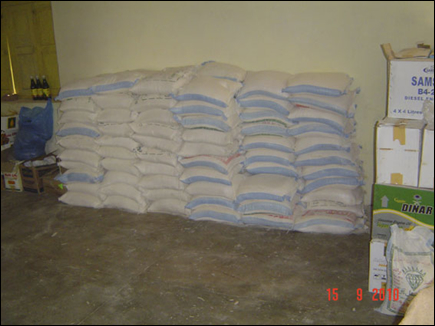 So far we have received commitments / receipts of funds of around Rs. 15.5 million (1.55 crores) in addition to donations in kind of around 70 lacs. We do hope to exceed our target of 5 crores in cash over the coming days to be able to build a number of homes for the poor people. I want to thank all the donors profusely for being open-hearted in donating so much from your hard earned money for the sake of Allah and His Creation. 1. Through Western Union, we receive the funds the same day and there are no transfer charges. This is the preferred method. If you wish to send through this, please send me an email and I will provide you details of the recipient, etc. Please do visit our website www.petarianfoundation.org for updates on the work being done and also visit the photo gallery there to see the pictures.